I saw this book on amazon and I was impressed with the pictures. I really want this book. I fold low Intermediate and Intermediate models with ease. However High Intermediate models will take some time to accomplish but I can still do them. Do you recommend this book for me? I don't want my money to go waste so I am asking your opinion! The model doesn't have hugely complex models, but rather works with relatively easy folding sequences. 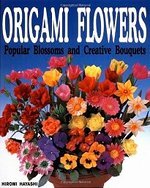 Be prepared to cut the paper to different polygons, and often use multiple sheets, or perhaps even color the paper before folding a flower (or glue sheets together). There are also some patterns for cutting leaves to adjoin the blossoms (vs. folding the leaves).